for $429,900 with 3 bedrooms and 3 full baths, 1 half bath. 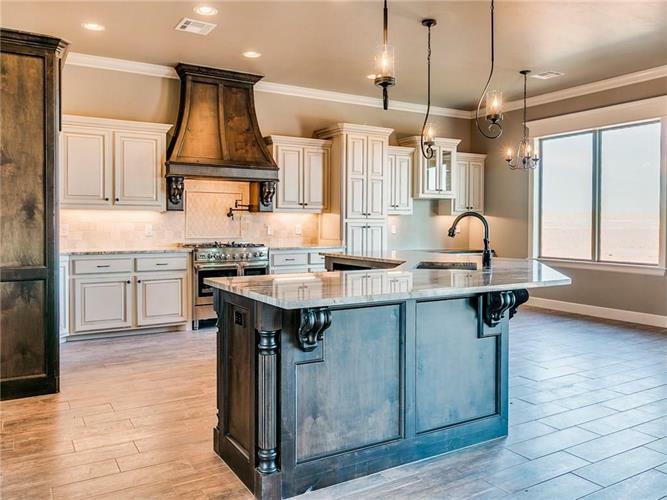 This 3,007 square foot home was built in 2017 on a lot size of 0.88 Acre(s). HUGE $10K PRICE IMPROVEMENT W/$8K CONCESSION to use towards buyer's wants, Outdoor Fireplace, Fence, Closing Costs, etc. Features & finishes include over the stove pot filler, upgraded stainless steel gas range, along with a microwave & dishwasher appliance package. 3cm granite throughout with custom tile backsplashes, showers, master tub, & bathroom floors. The master bath offers a curbless drop-in & a deep soaking tub. This fabulous home boasts 6" crown molding & 5 1/4" base molding in the master & great room with an amazing 8ft front door. This is a "must" see home in a superb location. Just a mile from highway 9/HE Bailey Turnpike or just a few minutes drive to I44 where you can get to OKC & the surrounding area in about 20 minutes. If you are looking for your dream home in a beautiful, quiet neighborhood that offers privacy yet just a few miles to "everything" then you need to take the short drive out to Pulchella & see for yourself what this beautiful home has to offer you. © 2017 [or current year] MLSOK, Inc. All rights reserved. Certain information contained herein is derived from information which is the licensed property of, and copyrighted by, MLSOK, Inc. We do not attempt to independently verify the currency, completeness, accuracy or authenticity of the data contained herein. It may be subject to transcription and transmission errors. Accordingly, the data is provided on an “as is” “as available” basis only and may not reflect all real estate activity in the market. Last updated 4/23/2019.